During 2015 we celebrated our 140th anniversary in a variety of creative, fun and educational ways. From designing and carving our history into an amazing totem pole, to themed lessons and learning something new in 140 minutes, and from the showcase of creative talent at our Arts Festival, to the Maypole dancing and time capsule at the Junior School Garden Party – we all enjoyed acknowledging and celebrating our heritage and successes. A detailed history of the school can be downloaded below. Before the 1870s, education for girls in Nottingham was fixed by social class, with limited opportunities for working class girls to receive any post primary schooling. The forming of girls’ education was largely due to the work of feminist reformers. The Girls’ Public Day Trust founded our school on 14 September 1875. It was originally on Oxford Street, with Mrs Bolton as Headmistress, before relocating to Arboretum Street, a former lace manufacturer’s house. When the school first opened, it had just 34 pupils, but by the time of its relocation it had expanded to 146. 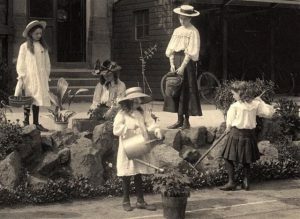 During the First World War years, 1914 – 1918, the school steadily grew and in 1921 it had reached 394 pupils and as such, had to expand into the neighbouring Radnor House. 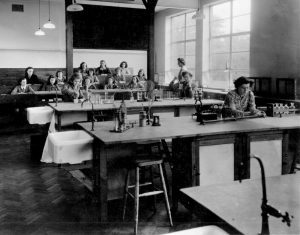 The following year, in 1922, alumna, Mary Browning, became the first woman in England to obtain a Doctorate in Physics at London University and in 1926 the first whole school ‘Panorama’ photograph was taken. By 1928, women over the age of 21 were able to vote in parliamentary elections and this led to increased visibility of women as councillors on the Nottingham City Council, as magistrates and as women police. Unfortunately 1939 saw the outbreak of the Second World War and NGHS moving to two separate locations: Ramsdale Park and Daybrook. During this time, the South Notts Hussars were stationed in the Arboretum Street buildings. However, by 1944/5 the school was able to move back. Just 10 years’ later, the number of pupils reached 800 and NGHS celebrated its 80th birthday. The 1970’s saw significant building expansion at the school and in 1975 NGH celebrated its Centenary. On the 18 May 1973, the Milford building was officially opened by HRH the Duchess of Gloucester and in 1978, HRH the Duke of Edinburgh opened the Edinburgh Library. In 1995, the House system was introduced and named after the first four Headmistresses of NGHS: Bolton, Hastings, Luxton and Skeel. The Bowering Sports Hall was opened by Richard Bacon in 1998 and eleven years later, in May 2009, the new Sixth Form Centre opened. Over its 140 year history, the school has been overseen by 13 Headmistresses and one acting Headmistress. Today the school is run by Head, Julie Keller.